In a daring bid to escape from the clutches of three alleged rapists, a middle-aged woman jumped from a two-storeyed building and seriously injured herself in the process at a house in Luxmi Nagar here this afternoon. The injured woman talks to a woman constable in a hospital in Ludhiana on Monday. The Punjab Bhartiya Janata Party President, Mr Brij Lal Rinwa, claimed that the decision on abolition of octroi in the state had already been taken and the announcement to this effect by the Chief Minister, Mr Parkash Singh Badal, was just a matter of time. The National Bridge Training Course for Craft Teachers and Vocational Instructors in the field of Visual Impairment in collaboration with the Rehabilitation Council of the Union Government got under way in the auditorium of the Vocational Rehabilitation Training Centre here today. Is your vehicle safe at a parking lot? The disqualification and subsequent removal of Mr Sat Pal Puri, a Congress councillor (Ward 66), by the state government has snowballed into a major controversy with the Congress councillors threatening to boycott the proceedings of the House of the Municipal Corporation, terming the government decision as political vendetta and victimisation. The Ludhiana Sessions Judge, Mr S.S. Arora, has convicted Bhupinder Singh (60) of Josadh village and sentenced him to undergo rigorous life imprisonment on a charge of murdering his daughter-in-law, Veena, alias Manjit Kaur, by setting her ablaze on May 19,1997. Mr Vikas Partap, Deputy Commissioner, Fatehgarh Sahib, has said that challenges posed by multinational companies under the WTO regime to agriculture and allied sectors can only be successfully met by further strengthening the cooperative movement, which already has a strong institutional network down to the village level in the state. In response to a call given by the Punjab and Chandigarh College Teachers Union, its PCCTU from different districts today started relay fast outside the Deputy Commissioner's office in Ludhiana. The relay fast will continue till September 10. There is a virtual polarisation among homoeopathic students, who will be appearing for the BHMS examination scheduled for later this week, over the issue of conduct of examinations on announced dates. Punjab Agricultural University has issued a charge sheet to the scientist who was charged with the molestation. The Infamous murder case of Avtar Singh alias ‘Golla’, involving former CIA in charge, Ludhiana Inspector Gurmeet Singh ‘Pinki’ as prime accused, along with eight others will now come up for hearing before the court of Mr B.S. Mehndiratta, Additional Sessions Judge, Ludhiana, on September 4. Tension gripped Dhurdkot village near Raikot after the village sarpanch “tried to dig a drain through a piece of land” owned by a woman whose soldier husband had died in the 1971-war. These physically challenged persons are, however, no different from other able bodied persons. Thanks to the Vocational Rehabilitation Training Centre, where Vinay, Jasvir and Jarnail Singh returned to pay their gratitude. Vegetables play an important role in our daily diets as in India a majority of the population is vegetarian. The onions as well as potatoes are used almost daily for cooking and are needed in bulk. To serve mankind, without any distinction on the basis of religion, race, nationality, caste, creed or sect, the Sri Sathya Sai Seva Organisation was founded by the followers of Sathya Sai Baba from all over the world. The samithis consist of members belonging to different ethnic groups and different religions, who have joined together to serve mankind. Rain lashed the city early this morning after a fairly long dry spell. After a bright but scorching day yesterday, clouds started appearing over the city in the evening following a mild east wind. By the morning, the clouds had cast a dark blanket around. As a result of the morning showers, the rest of the day remained relatively cool and pleasant. 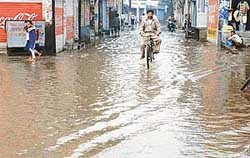 But the 30-odd minutes of rain, as usual, left many low-lying areas of the city flooded. Various social, political and literary organisations have condemned the Punjab Vidhan Sabha Committee's report on teachers appointed against an advertisement in 1992. General Officer Commanding-in-Chief of the Western Command, Lieut-Gen Surjit Singh, has stressed the need for having regular interaction between the Army and civilians. He said this would be an excellent confidence-building measure. A seminar on the Banking Ombudsman scheme was organised by Punjab National Bank here. Mr Khizer Ahmed, Banking Ombudsman for Punjab, Himachal Pradesh and Chandigarh, was the chief guest on the occasion. Senior bankers of banks of Ludhiana participated in the seminar. The brokers need to change their mind-set to trade in the derivatives, as it was less riskier than trading in equity shares. The basic knowledge is prerequisite to do business in the changed scenario. This was said by Mr Sandeep Singal, Manager, Derivatives Segment of Bombay Stock Exchange. Exporters and importers of the region have alleged that the clearance of their cargo at the dry port is being delayed due to mishandling of the material by the contractor of the Punjab State Warehousing Corporation. After the attack of whiteback plant hopper, the paddy crop in the district is facing a serious threat from another pest, a leaf roller commonly known as ‘Patta Lapet’ sundi. The paddy growers are fearing that the pest, which has affected a large area under paddy, may cause them huge economical losses. A two-days orientation programme for economics teachers from the CBSE- affiliated schools started this morning at GGN Public School. The aim of this programme was to make the teachers familiar with the new topics introduced in the syllabus of Class XI and XII this year. The book bank of Jagraon held a function to grant scholarships and ‘Gem of Jagraon’ awards here. It was presided over by Mr Balkar Singh Sandhu, SSP. Mr Gurcharan Singh Galib, MP, was the chief guest. Ten students, whose result in board examinations was outstanding, were honoured and presented medals and certificates of merit. “Education plays a vital role in one’s life for building the character and without education, one lives in darkness”. These views were expressed by Mr Jagtar Singh, general secretary of the Ramgarhia Educational Council, at a meeting held here. Stress and strain could lead mental health to disaster but strengthening will power and enlighten our innerselves through spirituality is the only way out left. These were the view of panelists during a discussion on the topic “Mental health and addiction — role of community” on the occasion of celebrations of annual day of Bhai Ghanaiya Sewa International, Guru Gobind Singh Study Circle. The Punjab Civil Medical Services Association has expressed resentment over what it terms as “meager chances of promotions and stagnation in the PCMS cadre”. The association claimed that only 1 per cent of the PCMS doctors were getting the promotion opportunity in a cadre of 4,700 doctors. The badminton hall of Sutlej Club has been renovated. The hall, which remained closed for the last three months, was declared open for the club members and their dependents on Sunday. Parminder Singh, captain of the Indian Basketball team has a long list of achievements. He belongs to Bhandal Bet village in Kapurthala district. He was always interested in sports. Since he comes from a village, where there is no basketball ground, he never played basketball in his childhood. Rajveer Singh and Sonu Kumar were adjudged “Muscle Man of Ludhiana” and “Handicapped Body-Builder” respectively, in the Ludhiana District Body-Building Championship organised by the District Amateur Body-Building Association at the Mai Nand Kaur Gurdwara Dharmshala, Ghumar Mandi, here on Sunday.